On the evening of Tuesday 8 March, a group of Flamsteed members visited the Institute of Astronomy in Cambridge. The members were treated to a short talk on the astrophysics of star formation by one to institute’s research students, Nimisha Kumari. She outlined her work comparing star formation rates between nearby galaxies to gain a better understanding into the factors influencing star formation, a talk which neatly complemented the previous evenings Flamsteed lecture on star formation in the early universe by Professor Serena Vitia. 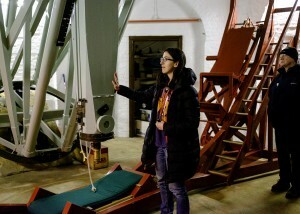 Following a lively question and answer session the group were given a tour of two of the institute’s historical telescopes by another of the research students, Sarah Bosman. Unfortunately observing through the telescopes was not possible due to a thick covering of cloud. Firstly we were shown the Northumberland Telescope in its steel domed observatory building. This telescope was designed by Airy, built by Ransomes of Ipswich and the London instrument makers Troughton and Simms and presented to the Observatory by the Duke of Northumberland in 1833. The original object lens was an achromatic doublet made by Cauchoix of Paris with clear aperture of 11.6 inches and a focal length 19ft 6in. (Not considered of good optical quality by today’s standards, the lens has been replaced with a 12 inch aperture visual achromatic doublet). Interestingly the telescope is on an English form of mounting with its polar axis frame and tube made from Norwegian fir. The telescope was for a time one of the world’s largest refracting telescopes. Sarah described how this telescope was used by James Challis in his the search for the planet Neptune in 1846 and how he was narrowly beaten to its discovery by observers at the Berlin Observatory following predictions on its position by the French mathematician Le Verrier. We were then shown the Thorrowgood Telescope in its small, wooden observatory building. This telescope is on a German equatorial mounting and was built by T. Cooke & Sons of York & London in 1864. It has achromatic doublet object glass with an aperture of 8 inches and a focal length of 114 inches. It was bequeathed to the Royal Astronomical Society by William John Thorrowgood in 1928. Having no suitable place to erect it or to store it, the Society offered it to Professor Eddington, Director of the then University Observatory, initially for a period of 10 years. Erected on its present site early in 1929 the telescope remains “on loan” to the Institute. The telescope is now used for double star measurements by members of the Cambridge University Astronomical Society and on public observing evenings. Finally, we were shown the modern 16-inch catadioptric telescope (an optimised Dall-Kirkham design) which, due to its ease of operation, now tends to be used during public observing evenings in preference to the older, historic instruments. The Flamsteed Astronomy Society would like to thank the Institute of Astronomy and its Outreach Staff for hosting this enjoyable and informative visit. The Northumberland Telescope with a novel lens cap!